In our production plant we saponify every vegetable fatty acid as desired by our customers. Due to our know-how and experience we are able to also process special fatty acids that need particular attention or extended production time. In addition to large orders we can provide small quantities as well. A number of production steps are taken to prevent clumping. We deliver meal, granulate and pellets. 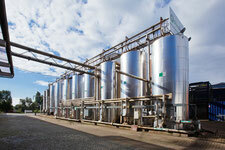 OleoServ provides storage capacities for liquid fats and fatty acids for up to 3,000 MT in heatable tanks. 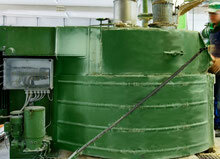 The single tanks have capacities between 30 and 500 MT. Thus OleoServ even offers storage facilities for single tank trucks. In our own laboratory we constantly support all production processes and examine on request different parameters of the stored liquid fats, oils and fatty acids. Of course, we also retain samples of all produced products and their ingredients. In addition to our own laboratory we also work with well-known external laboratories that deliver internationally accepted results. Especially our production of feedstuff is constantly controlled and samples are analyzed by companies such as SGS. 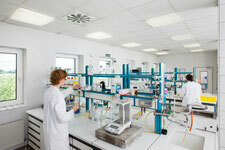 If customers demand special analyses that we are not able to deliver ourselves we also instruct external laboratories. We are certified as meeting the requirements of ISO9001:2008 and GMP+B1.